I am excited to announce my participation in the First Fridays Science of Art at the Wonderlab! 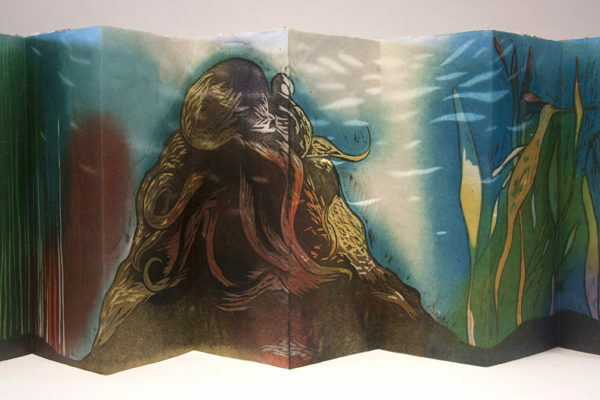 On September 2, I will be sharing my enthusiasm for deep sea life and artist books! The ocean is a mysterious and alluring place where, in the vast deep waters, light gives way to darkness. Down here scientists are working to discover the wide range of strange and intriguing life forms that flourish in these cold, high pressure ecosystems. During this First Friday: Science of Art, participants are invited to draw on the ocean as a point of inspiration as we create deep sea creature pop ups and work together to create an artist book featuring an underwater ecosystem. Come contribute to the evening! WonderLab’s Science of Art Series takes place on the First Friday evening of each month from 5:00-8:30 pm. Museum admission is 1/2 price after 5:00 pm.